I emptied my mind, and this is what happened! Regarding the motor, I have a compressor that has the motor labeled as a 12VAC motor. However, it is DC. In fact, connecting it to a AC supply will just burn up the coils. Maybe the motor is a DC motor that has an integrated rectifier? That’s really cool, makes you wonder if there are any other similar inflatable lawn ornaments that could easily be turned into fancy dress / halloween scare costumes. That reminds me, digitally remastered Ghostbusters is in the cinemas for Halloween in the UK! ergh, sorry, thought it would post a link, not the window. very nice. Ghostbusters was my favorite, growing up. but we were poor, so I had make my own toys with an old back pack and curling iron. all that aside, I wonder what fart jokes he will endure at the party. How the hell does he go to the can!? Even more importantly, how does he get drunk? I don’t lol didn’t think that through. I also need a crazy straw to get liquids in, although that would make me need to use that bathroom more often lol. Thats crazy though. Looks like plenty of room to get laid IN it! Where is my proton pack when I need it. Great thinking outside the box(so far out of the box you can not see the box). It likely has a universal motor – the current feeds both the armature and field coils wired in series. DC/AC doesn’t matter because as the polarity reverses the magnetic fields also flip in tandem providing consistent torque in one direction. More importantly – Awesome costume. Real tempted to hit the stores tomorrow to see if I can find a good candidate for a quick version of that. end I think you mean and. Not cool dude and not in the spirit of what this site is about. This is beyond excellent! 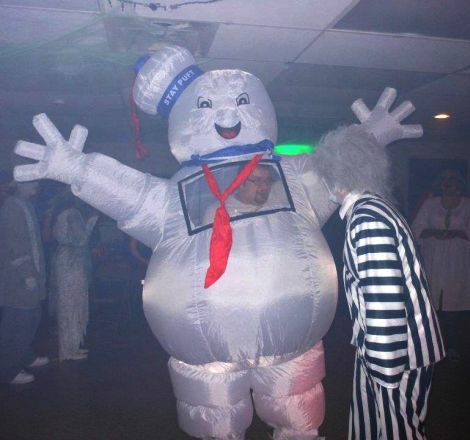 I’ve often wondered the best way to make a Stay-Puft costume but they all seemed to heavy or bulky. This is perfect. A decent Vigo the Carpathian would be a nice addition to this. That’s a great way to avoid intoxication as well as infection at social events while maintaining personal space! Maybe he can have a guest in there? Actually this is a pretty cool costume for some parties I’ve been to lately. Everyone is sitting around texting and facebooking and looking expressionless. You really need a costume that allows you to grab girls, preferably in some outlandish and mildly alarming manner so they get scared at first and then start laughing. Probably get kind of sleepy after poping 20 co2 cartridges in an enclosed space. Pretty sure the box of those things says not to use in enclosed space. Funny image though. Avoid duct tape, next year it will be allover the rest of the costume. Contact cement or Pliobond might be able to simply glue up all the mods. Inflation (good kind) use two wedge single fold bellows under each shoe. Non electric could run a hazmat suit in dead power sites. This would need a pressure relief valve, as fast walking would over inflate. This also solves fart damage, should it be big enough. I just finished my own version last week and went to a party on the weekend. I asked a local seamstress to help me out. She stitched in a vertical zip in the back for access and stitched the clear vinyl on the front. That way I was able to cut out the widow myself. I only cut three sides so I have a “privacy flap”. I used white gaffer tape to edge the window. It worked great and looked really cool. I was the last to arrive and put the costume on hiding from everyone. The room was silent when I walked in.